Am I the only one incredibly frustrated when the little italics icon is grayed out in Silhouette Studio? Such a tease! Well, guess what, my friends. I've figured out a work around for those stubborn fonts that just don't want to be italicized. This little trick has also saved me money in that I often will not buy a full font family (such as the popular Samantha font) and instead will only get the upright version and do the italicizing myself. Wait 'til you see how easy it is! You'll notice that if you use your text tool and pick a default font like Times New Roman you get the bold, italics, and underline options. BUT if you pick certain fonts (I'm thinking it's fonts not pre-loaded into the program but rather those you've downloaded and installed onto your computer and therefore into Studio), you only get the underline option and not bold or italics. Well, well, well...it's a mighty goody thing we can put an offset around a font to bold it. What you're going to do is type out your text like your normally would. 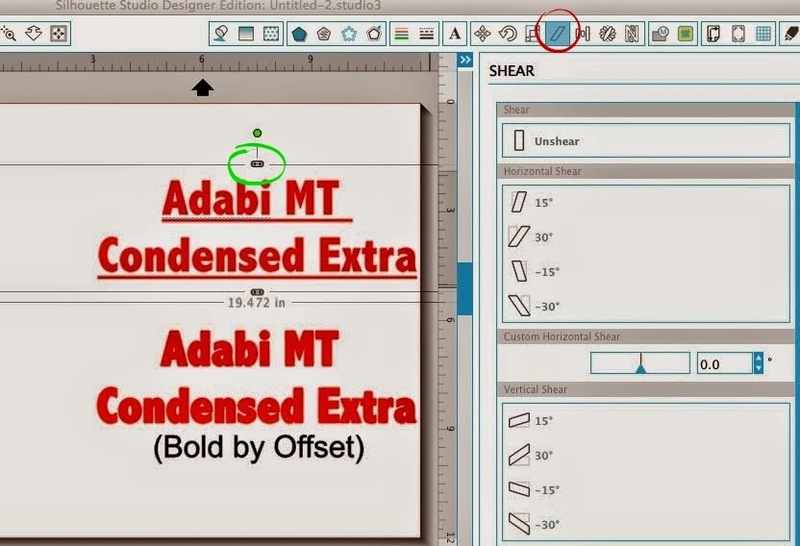 Select the font and then pick the shear tool. It's the little slanty looking tool along the top (circled bleow). When you click on it, you'll get this window on the right. Again, you won't have this option unless you have Silhouette Studio Designer Edition...so I hope you asked Santa for it! 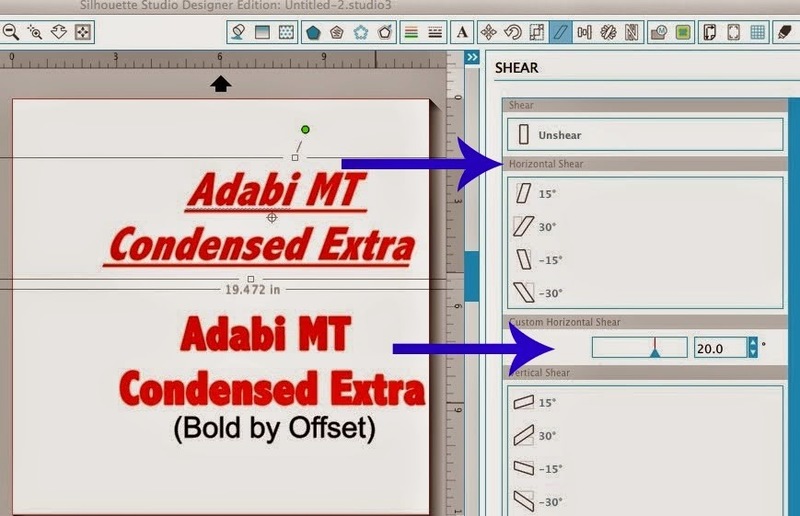 Now you want to click on your text so you can use the shear tools. You have a few options... you can grab the little slider bar (circled in green above) around the text box and drag it right or left until the text is italicized enough for your liking. You can pick a pre-determined shear degree of 15 or 30. You can also manually type in the degree you'd like your text to shear in the Custom Horizontal Shear box. That's all there is to it italicizing fonts in Silhouette Studio that don't have the italics option. Thank-you so much! I needed a slanted font for the IMPACT font, and this does the trick. So happy my son and DIL got me the DE last Xmas! wow -- that is fantastic -- I never knew how to use that option! Whatever you own, run or visit, whether it is a lodge, cabin or summer place, nothing welcomes people in the same way as a creative wooden sign does. If you are looking for a custom sign, nothing matches the look and feel of an old world style, deeply carved wooden sign; primarily because with this type of sign has no limitations.